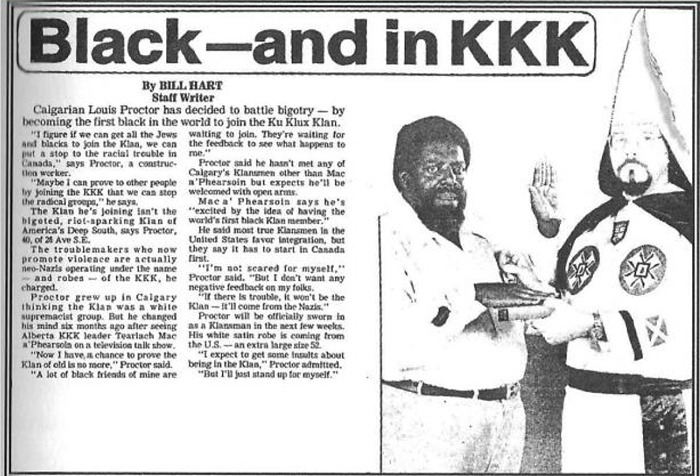 In 1981, Louis Proctor became the first black member of the KKK. Apparently this was a more liberal, Canadian chapter of the Klan that had announced they would accept black members (to prove they weren't white supremacists). So Proctor took them up on their offer. He explained, "I figure if we can get all the Jews and blacks to join the Klan, we can put a stop to the racial trouble in Canada." 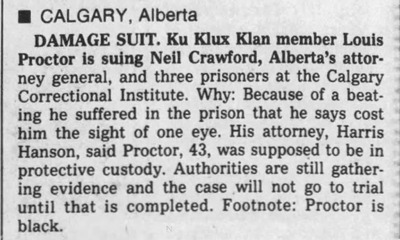 The only follow-up story I can find about Proctor is from 1985, by which time he was in prison and suing the state because he hadn't been protected from being beaten up and losing sight in one eye. I wonder if he remains the only black Klan member. I recall a story about a guy in a small Idaho town answering a mail-order ad from the Klan seeking new members. The Klansmen were real happy to get his letter and encouraged him to start a new chapter. That's when he revealed he was black. What happened next, I don't know. 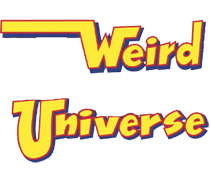 Sometime in the mid-90s, I heard a Klan chapter (in Arizona?) was advertising for a seamstress to make robes, and they listed themselves as an equal-opportunity employer.